1. Worry is a matter of my heart and when I worry, it tells me that I am not trusting God with that particular issue. 2. Worry is one way the enemy strives to get me down–and I need to fight back. When I worry, my thoughts are negative. When these thoughts enter my mind, I need to stop those thoughts and replace them with Godly thoughts (Truth from God’s Word). 3. God has a purpose and plan for my life. My life should be lived with one main goal: to love Him and to bring Him glory. When I love Him–I trust Him. Trusting Him means I won’t always understand why He allows me to go through something painful in my life, but I trust Him to know He has a purpose for it all. 4. Surrender everything to Him, and I mean everything! This means I trust God to do anything He sees fit to do with me (including taking my life). 5. One way to align my life with God’s will is to ask Him to replace the dreams/goals I have for my life with His will for my life. 6. Stop worry with prayer! Many times I worry more when I have strayed away from God. By spending time with Him, I grow to know Him more which leads me to trust Him more. 7. Worry often comes from being too focused on ME! I need to take my focus off of my problems and get busy serving God. 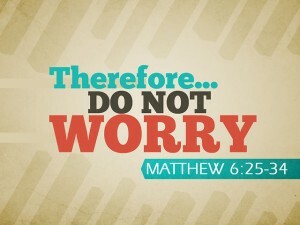 Getting my mind focused on His work, has helped alleviate worry in my life! I hope this post has encouraged you today! Thanks for reading!